This past April 6th, 2019 marked a historic day in Sudanese history. Thousands upon thousands of people took to the streets of Sudan to protest against the government and demand the world’s attention to the atrocities going on in the land of gold. Of all the people that joined the marches, two thirds of the brave people were women. They did everything from passing out food and water to those who needed it, to standing on top of the highest points they could find to shout their truths for the whole world to hear. These brave heroines—clad in white as a symbol of working women in Sudan—constantly put their lives on the line to fight against the oppressive Sudanese government, and are fondly known as Kandake due to the shared strength, resilience, and grace they share with their Nubian ancestors. You see, long ago in Ancient Nubia, legendary women called the Kandake lived and prospered. The Kandake were queens of the Kingdom of Nubia, and were known for bringing prosperity to the land of gold. They were as vicious in battle as they were kind to their people. Even their rivals in ancient Egypt were threatened by these amazing women and their power. These brave women were considered equal to their male pharaoh counterparts and have even led militaries and fought alongside soldiers. One such Kandake even fought back the ancient Roman Empire and prevented them from expanding their territory to Sudan. You would think that the era of the Kandake ended with Ancient Nubia, but this couldn’t be further from the truth. 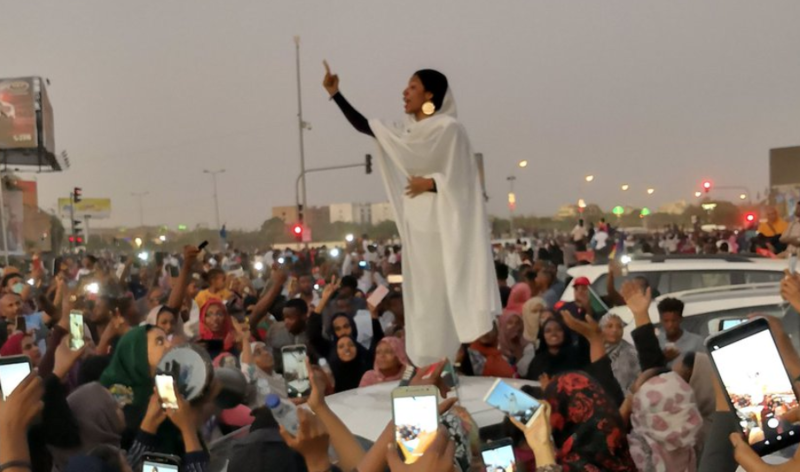 Right now, as we speak, powerful women clad in white are marching in the streets of Sudan, and putting their lives on the line in the hopes of bringing forth a better standard of living in Sudan. Their voices can be heard for miles singing traditional Sudanese songs of freedom and hope. Their beauty is unparalleled as they climb on top of cars to shout at the top of their lungs for a better Sudan. Even when they throw tear gas canisters back at those who seek to subdue them, they still have the same commanding grace and presence as their Nubian ancestors. Sudan has been dealing with Omar Al Bashir’s oppressive government for 30 years. Under his regime, hundreds and thousands of Sudanese people have been killed simply for speaking out against the corruption of the dictator and his government. While the rates of poverty in Sudan are higher than they have ever been, and produce prices continue to increase day by day, Al Bashir and his lackeys travel all over the world and buy lavish houses and expensive jewelry for their spouses. In one of the most extreme cases, the Sudanese people were unable to even withdraw their own money from banks. Dealing with this for 30 years has, of course, angered the people of Sudan. With the constant stream of empty promises and condescending speeches from our so-called president, the people have had enough. A right to free speech and protest that many be taken for granted in countries such as the U.S. could amount to a death sentence in Sudan due to this vicious government. Nobody is safe from the wrath of these heartless souls. Children as young as 5 have been killed by officials known as the “kezan”, the president’s personal team of hit men who disguise themselves as normal, everyday people instead of wearing their uniforms. Their purpose? They go into crowds of protesters and shoot at random. Even people who don’t actively go out onto the streets are not safe from the wrath of the government. My own relative, a young doctor at the time, was shot multiple times in the back and killed simply for attempting to care for the injured at a makeshift clinic. Many more just like him fell to the horrible dictatorship of Omar Al Bashir. Despite all of this, the protests in Sudan are garnering little-to-no media coverage, and it oftentimes falls to Sudanese people all over the world to share posts and videos taken by those who are protesting in Sudan firsthand. This lack of attention by the world has understandably upset the Sudanese diaspora, and many feel abandoned by those who they once considered their brothers and sisters. Despite this setback, the Sudanese people remain undeterred, and they still continue to protest and fight against the oppressive regime. This bravery and resilience displayed by the Sudanese people has inspired the hearts of many and despite the danger, men, women, and even children still continue to march, protest, and fight against the oppressive government that is attempting to silence them into submission. Hopefully soon, the people of Sudan will finally be free of the oppressive Al Bashir regime, and even without much media coverage, we will still continue to use social media as a weapon against those who seek to subdue us. From the powerful Kandake in the white toabs, to the powerful Sudanese kings protesting alongside their female counterparts, to the young children who sing songs of freedom as they play in the streets. One day, Sudan will have the freedom it deserves.